If you’re a Game of Thrones fan, you know better than to get too attached to any particular character(s). The show’s death toll could wage its ruthlessness on just about anyone — even protagonists who you might *think* are safely out of harm’s way. But knowing all this doesn’t make the next fan theory any easier, because it specifically targets one of our favorite GoT houses. The most recent GoT theory predicts that all of the Starks must die for the game to be won, and our hearts are breaking over it. Yup, we’re talking about Arya, Bran, Sansa, and Jon Snow. Exhibit A: The book’s title. "The giants are almost gone as well, they who were our bane and our brothers. The great lions of the western hills have been slain, the unicorns are all but gone, the mammoths down to a few hundred. The direwolves will outlast us all, but their time will come as well. In the world that men have made, there is no room for them, or us." The theory says that the direwolves in question symbolize the Starks, and the prediction that “their time will come” definitely does not sound good. But then again, the monologue can be read literally, and could really have nothing to do with House Stark. Maybe Leaf just IS talking about the extinction of the mythical creatures of Westeros. But, dear GoT fans, all hope is not lost. 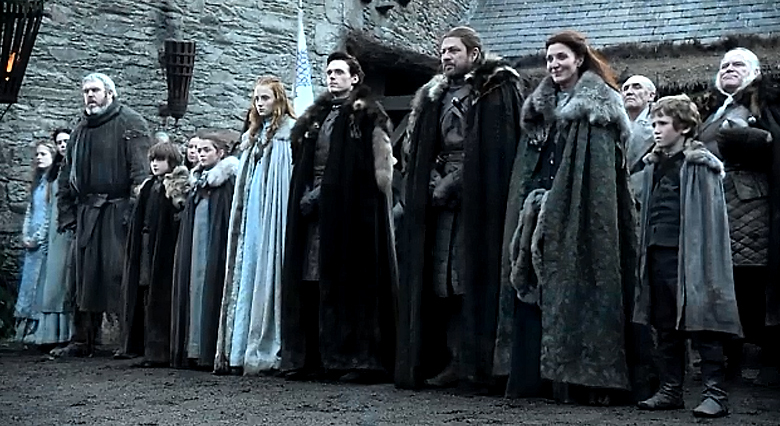 As Moviepilot points out, there’s been a LOT of character growth invested into the Starks. Would Martin really just kill them off in the end? All we know is that we can hardly wait for season 7 to find out.